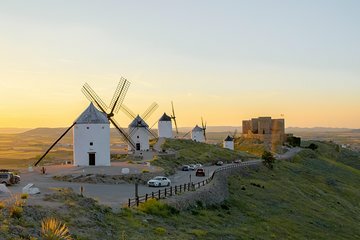 Cover the highlights of Consuegra with a single admission ticket, the most cost-effective way to tick off all the sights. The special combo ticket includes entry to four different locations, including the famous 10th-century castle and two different storybook windmills, with guided tours available during grinding season. Tickets have no time limitation, so you can visit at your leisure. You can pick up your tickets at the Windmill Rucio, at the end of the access road to the mills. We recommend you arrive at least 30 minutes before the start of your activity. Some practical recommendations: • You can pick up your tickets at the Molino Rucio, at the end of the access road to the mills. We recommend you arrive at least 30 minutes before the start of your activity. • Bring comfortable footwear: both the castle and the mills have stairs and areas with rugged terrain. • The monuments are not accessible to people with limited mobility: there are spiral staircases and insurmountable areas for a wheelchair. • This entry has no time limitation. You can visit the castle and the mills whenever you feel like it, as long as you keep in mind the minimum opening hours of each monument. Take into account the minimum duration of visits (1 hour for the castle and at least half an hour for each mill) when planning your visits. • When you get to Consuegra you will see two signs of prohibited access to vehicles. Do not worry, they only affect buses and caravans. The cars can access and park next to the mills without problem. • Minimum hours of each monument: Castle: from 10:00 a.m. to 6:30 p.m. Molino Bolero: from 10:00 a.m. to 6:30 p.m. Molino Rucio: from 9:00 a.m. to 7:00 p.m. Museum: from 10:30 a.m. to 2:30 p.m. and from 3:30 p.m. to 7:30 p.m. Tuesday and Wednesday closed.